The secret is patience. 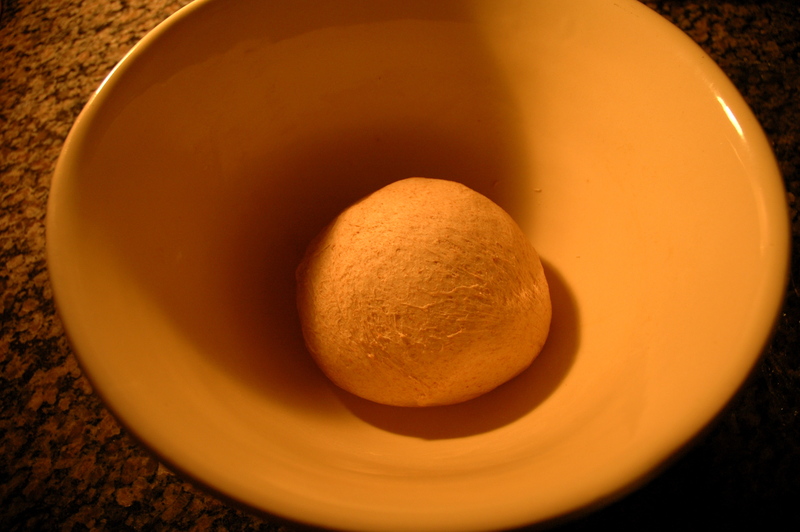 Love your dough and don’t rush the process if you want your bread to love you back. It’s a bit like child-rearing, only it doesn’t take 18 years to raise a loaf. And it’s a whole lot easier because bread is so much more predictable than a human being is. Place your oven baking rack on the center shelf. Turn your oven on to warm (lowest setting) for five minutes (absolutely no longer than 5!) and then turn it off. 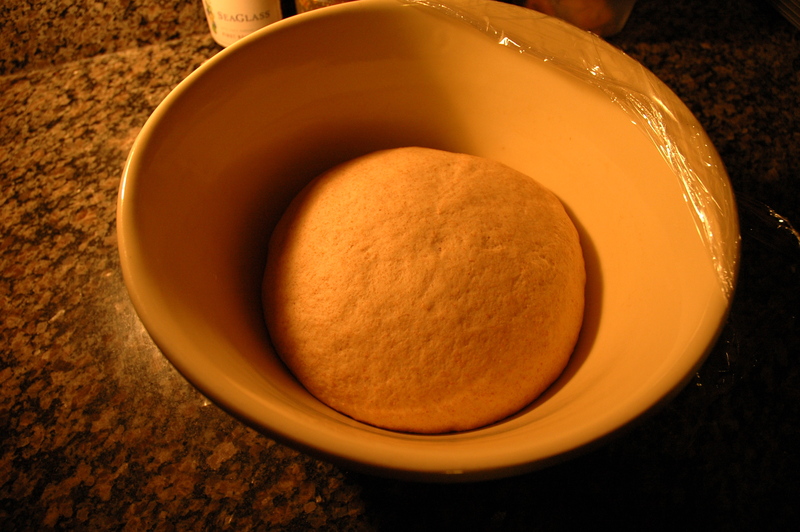 This little warm-up creates a perfect environment for your dough-rise. But don’t forget to turn the oven off before you start the next step. Dissolve the yeast in 1/4 cup warm water (100-115 degrees F) with 1/4 teaspoon sugar. The mixture will begin bubbling within 5 minutes. 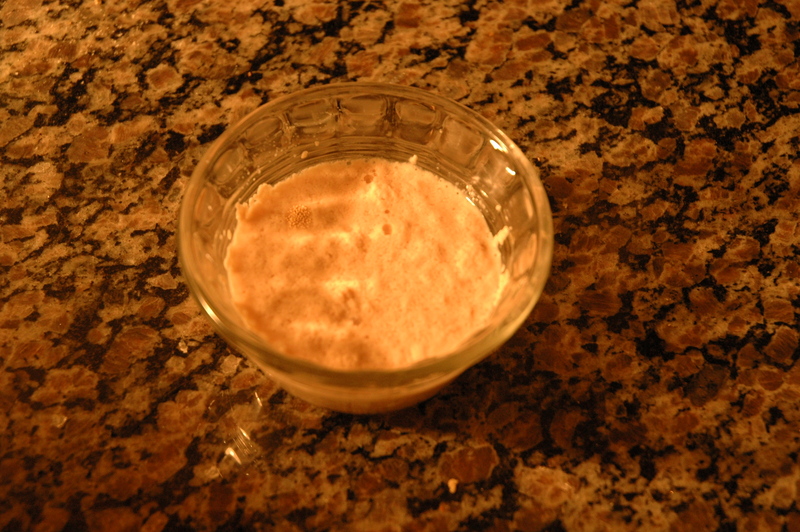 If it doesn’t bubble, start over with fresh yeast (if no bubbles, you’ve got dead yeast and your bread will not rise). 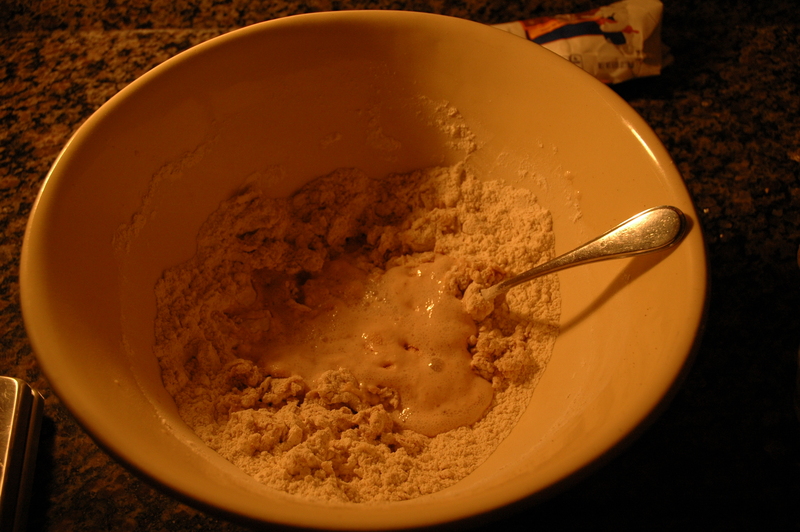 In a large bowl, combine the flour(s) salt and sugar. Mix well with a fork or whisk. Add the proofed yeast and most of the warm water. Stir to combine. 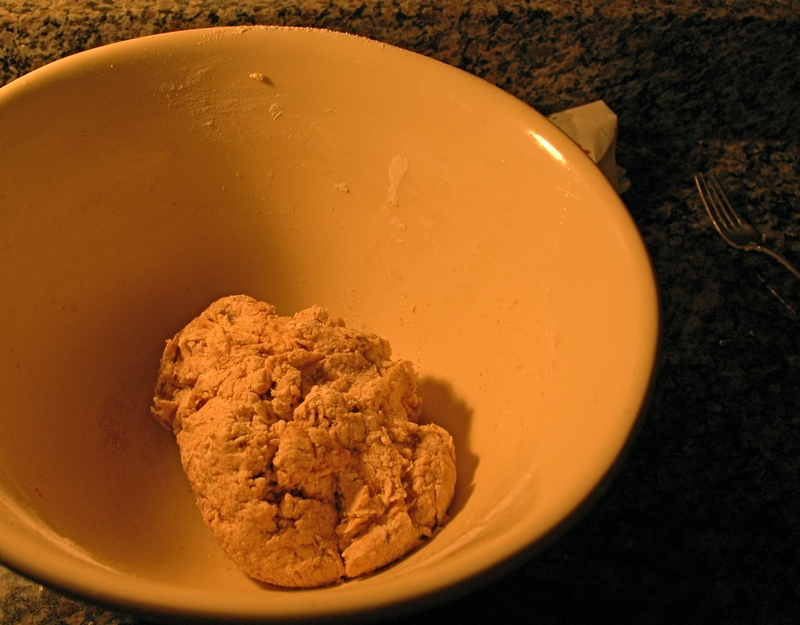 Keep stirring until all the dough is moistened and forms into a ball, adding a little more water if necessary. 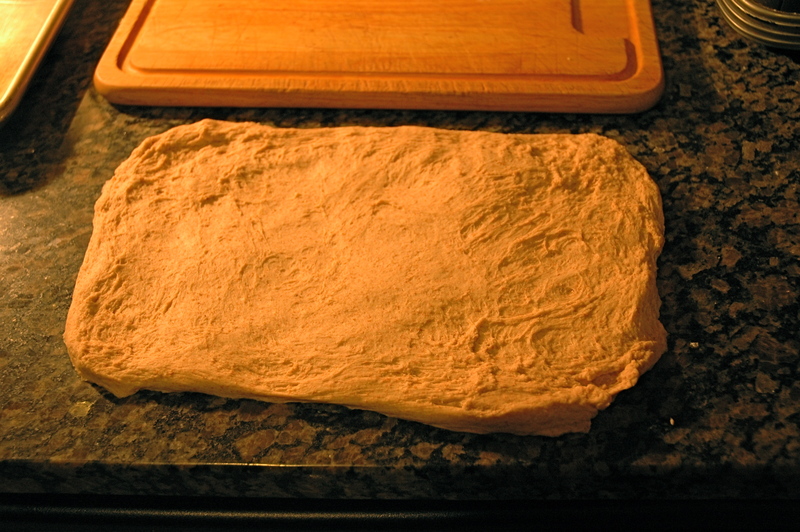 Your dough will l0ok craggy and lumpy, like this. 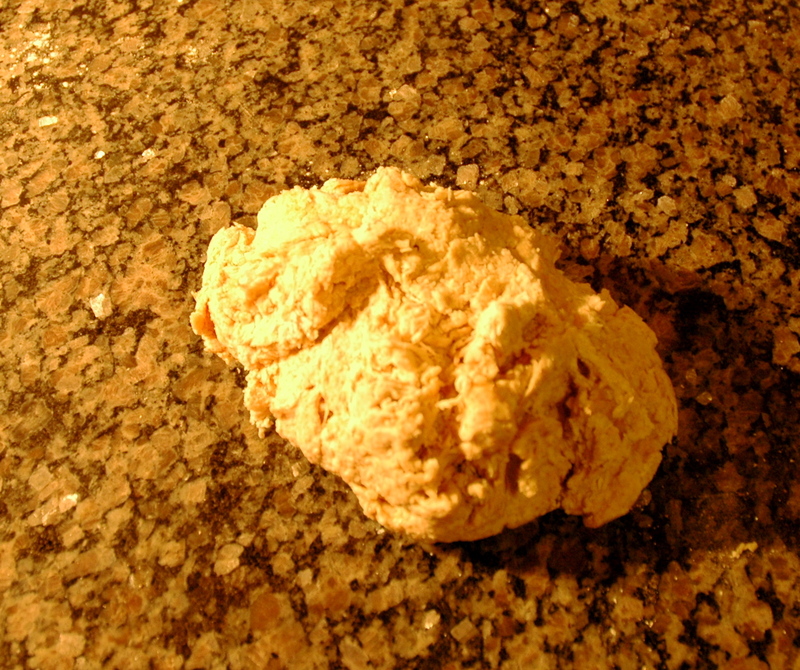 Put the dough out onto the counter to knead it. 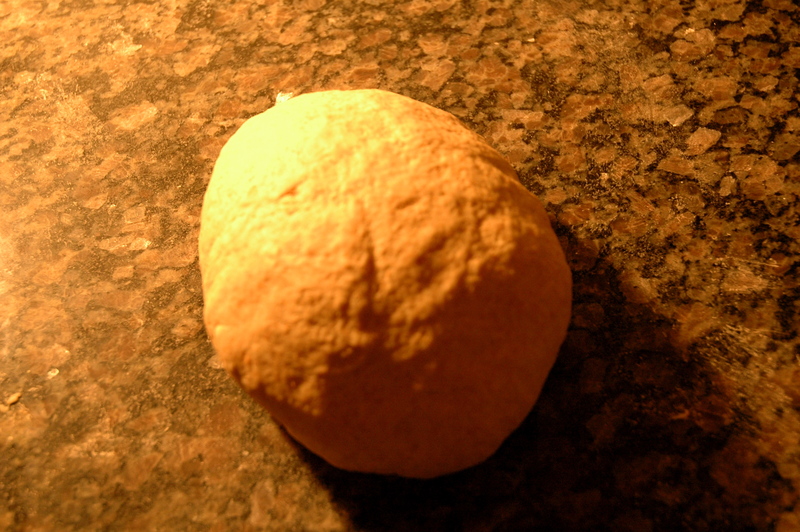 If you want a short course in kneading, click here. The important thing to remember while kneading is–you have to patiently enjoy this 10-minute process and keep thinking good, loving thoughts about the people who will be eating your bread. Bread absorbs and transmits love (and conversely, you definitely don’t want to take out your frustration and anger on your dough or it just won’t turn out right). I’m pretty sure this has been unequivocally proven to be true. Your dough should feel smooth and silky. Cover the bowl with plastic wrap or a snug-fitting lid. Set it in your warm, draft free oven for 40-45 minutes. Your dough will be twice as big in volume as it was when you started. If it’s not double the size, let it rise a little longer. Then poke it like you’re jabbing the Pillsbury Dough Boy in the tummy, and reform the dough into a smaller ball. Cover it and let it rise again. 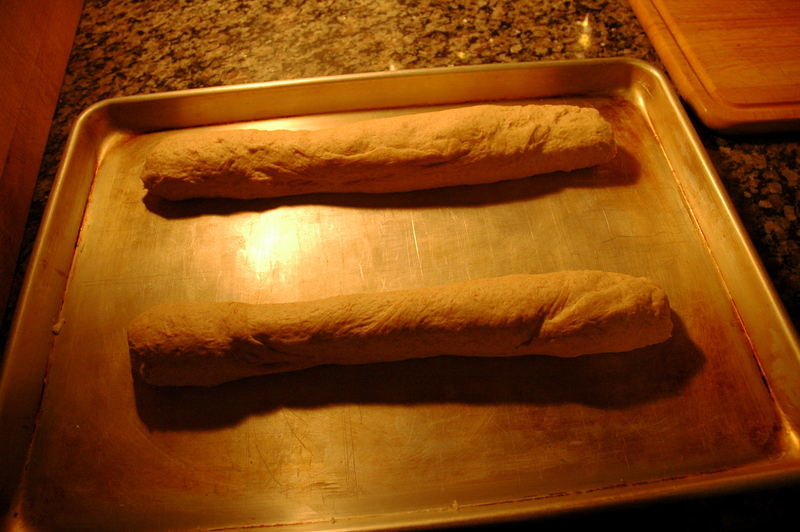 (This double rise is one of the secrets to French-bread texture). It looks like you’re starting over. But the 2nd rise will only take 25-30 minutes. The yeast is active and will work quicker the second time. 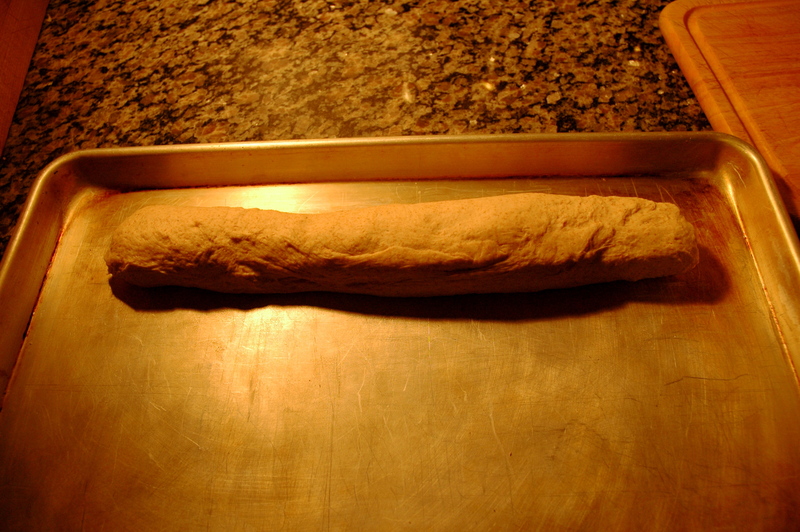 Starting with the long side closest to you, roll the dough up into a somewhat even roll. Don’t get neurotic over this; a little unevenness is fine. 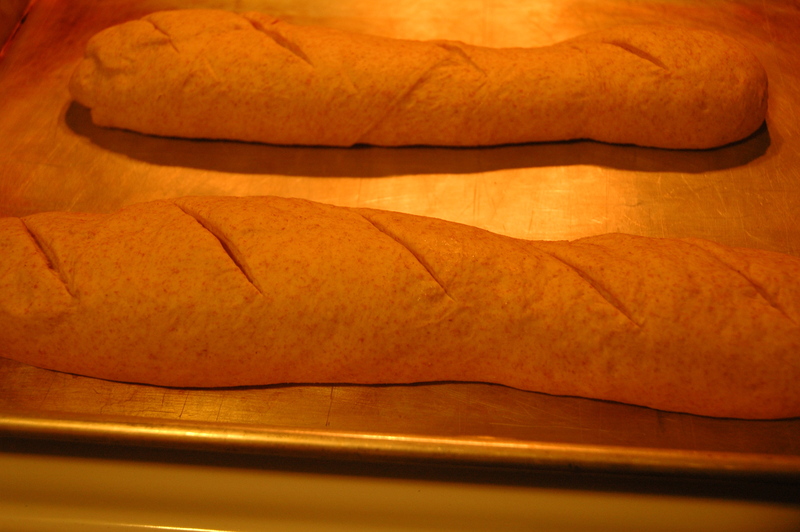 This rolling is the other secret to the French-bread texture. 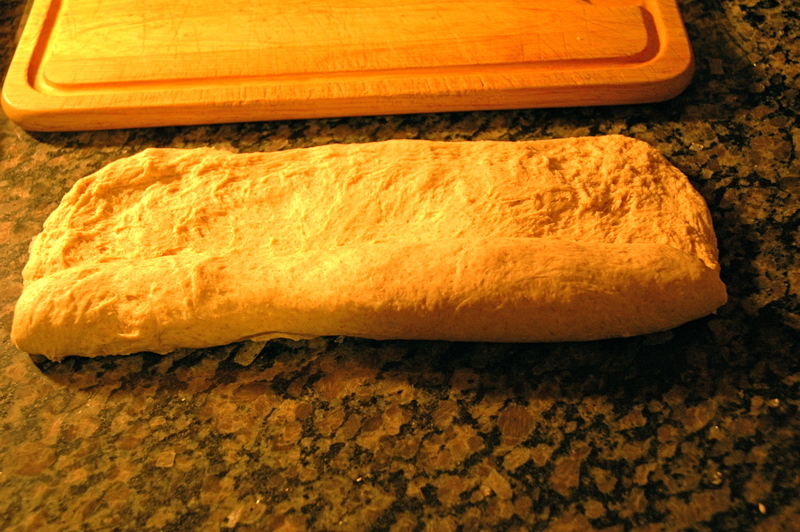 Place the dough on a baking sheet (seam side down), leaving room for the other loaf. Turn your oven on to 425 degrees F. Cover the loaves with plastic and set them on top of the oven to rise until double in bulk, about 20-25 minutes. You’ve rolled it and patted it, now mark it with a B and put it in the oven for Baby and me! Well, actually, what you want to do is cut 4 or 5 parallel slashes, with a very sharp knife, about 1/4″ deep into the top surface of each loaf. 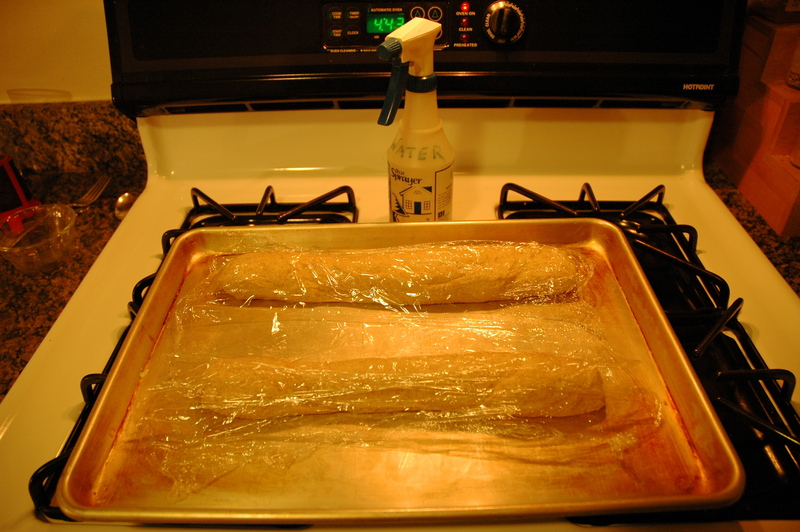 This will keep the loaf from bursting when it rises a little higher in the oven. Your loaves will look like this. Mist them with water. They’ll glisten. Put the sheet pan on the center rack of the oven and immediately reduce the temperature to 375 degrees F. Set a timer for 5 minutes. Beep-beep-beep. 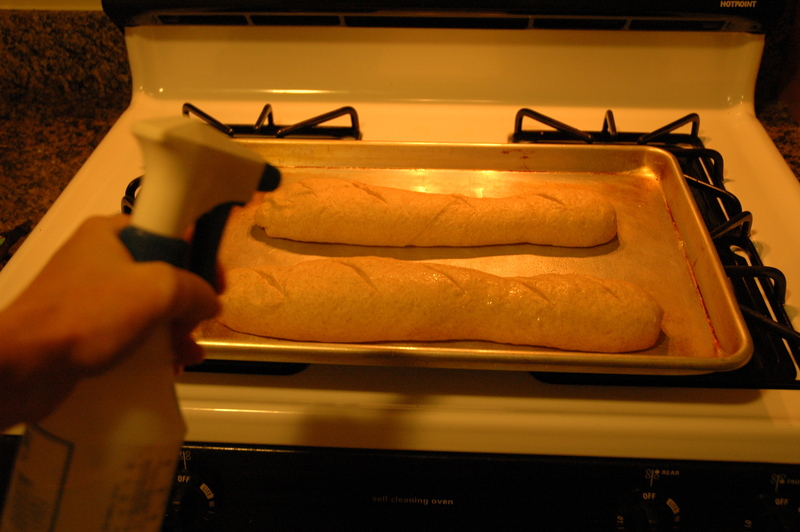 The timer says it’s time to mist your loaves once more. Open the oven door and give half a dozen healthy spritzes, and let water drops fall on the hot pan, too. 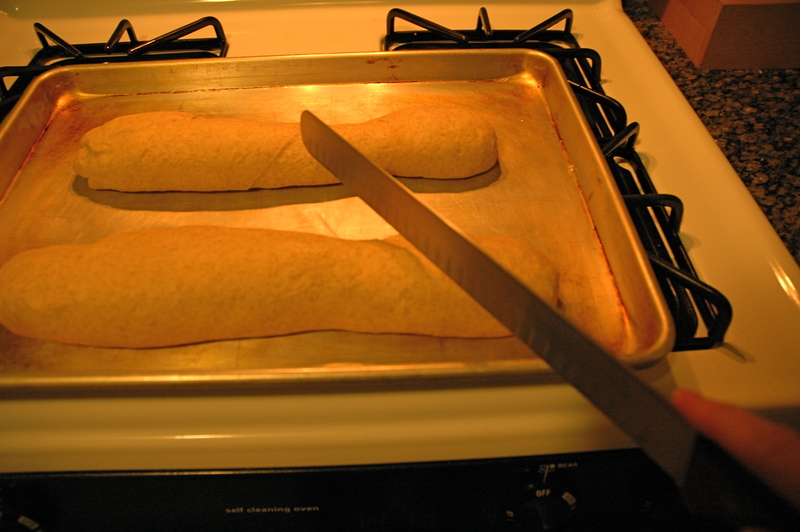 The steam will work to create a nicer crust. Repeat this spritzing again in 5 minutes. Then set the timer for another 17 minutes (27 minutes of baking time in all). If they’re good and golden, take them out. If they’re not, give them another 3-5 minutes to brown up. And there you have it. Let your loaves cool on a wire rack for at least 30 minutes, and then enjoy. What do you make, dear readers, when you want to feel like a clever and thrifty gourmet? Would you believe I used to make all my bread?? I agree with Kate, these loaves sure look good! Thanks, friends. They were indeed yummy. Yes, I believe you used to make all your bread, Diana. We do. I don’t think I could do it alone, my husband is really the master bread baker. I just do the occasional little projects like this one. A charming lady of many talents. Wonderful – I can just imagine how good your kitchen must smell! Oh, yes, it smells good in the kitchen, and does taste best when it’s still a little bit warm. It is a bit of a TLC bread, but it’s worth it. It looks like “Happy New Year” bread! Happy New Year, Susanne! Bread tastes different here, both the German and the American are good, but I think our wheat is somehow substantially different from yours. Any times I visit different areas of the U.S.A. but I don’t adapt to the bread of your country! But I like subway, now we have it in Germany, too. Well, they look great Tracy. My husband is the bread maker in our family – he can vent his work-related exasperation on the kneading process! I shall pass your post on to him!! Jill, I just reviewed my favorite crock pot cookbook on goodreads, and your comment reminded me that I wanted to ask you. are you by any chance on Goodreads? If so, do you like it? I’m finding it less easy to learn than wordpress is. I couldn’t live without my crock pot, Tracy! I have two different versions of Fix it and Forget it…I love those books! As an avid reader, I’m ashamed to say, I’m not on Goodreads. I haven’t had the time to check it out. I’m discovering I can’t be in too many places at the same time. 🙂 I’m clueless with Twitter and rarely on Facebook. No shame in not being on Goodreads. I’m just checking it out, not sure it’s worth my time…And I haven’t even tried Twitter. I do facebook, though. It works for me to stay in touch with old friends, mostly school chums. I thoroughly enjoyed reading your recipe and process. We will give it a try. I think Candisn wheat is different too. 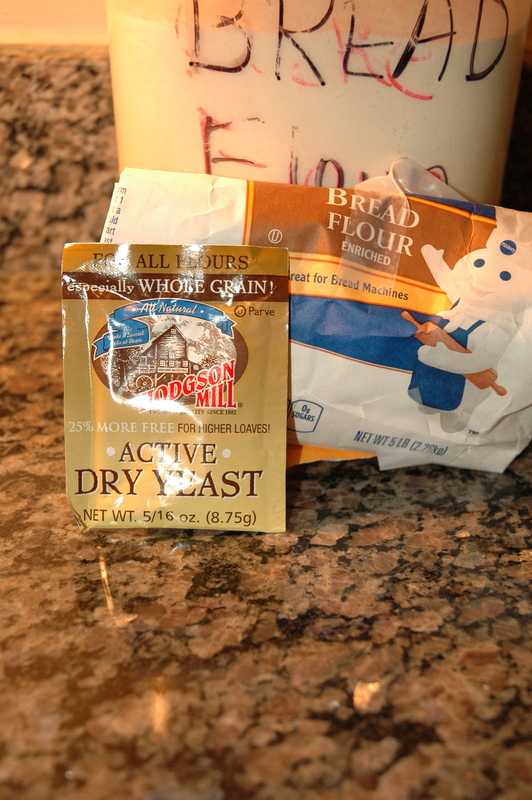 Some recipes in the US call for bread machine flour and note ‘in Canada use bread machine or all purpose flour’. We will have to experiment. You can use all-purpose flour, but it won’t rise as well. 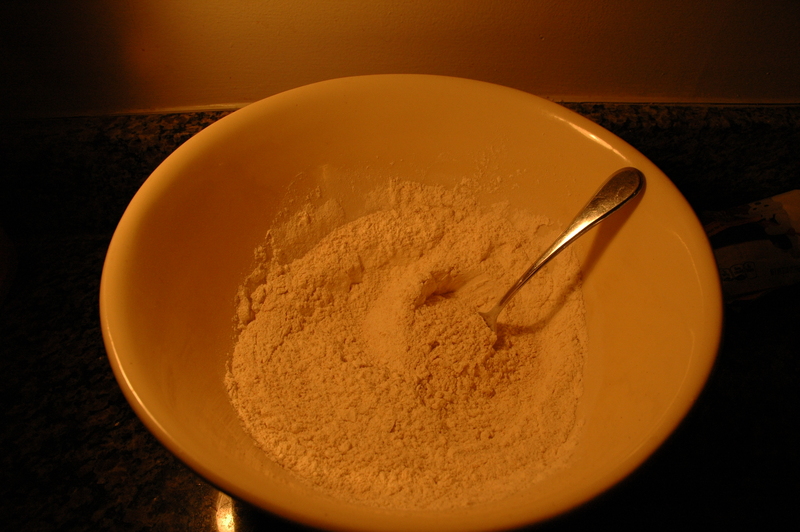 The amount of gluten in bread flour, if you use it, will make the loaf easier to handle. My oven hasn’t worked for years – never had a fan, and the seal and temperature gauge fell off a few years ago. 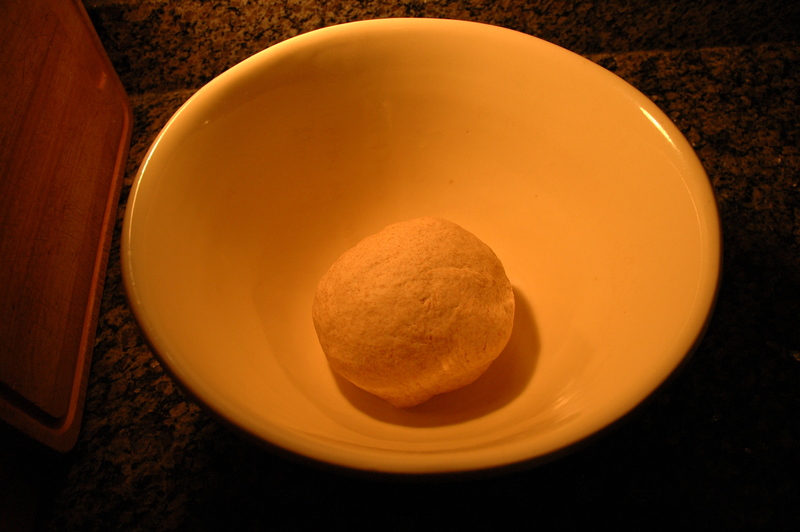 I have finally bought a new one and am soooo looking forward to making rolls and bread – it’s impossible if you don’t have a good oven, comes out hard and shiny like a big pebble. This post has inspired me that it is possible! It’s not possible to get them as “crackly” as in the professional ovens, but they are yummy, and they do have the right texture. And oh, yes, it does smell good when we’re baking. I try to wait–sometimes I don’t succeed. But it gets all gummy along the cut-line, if I cut it while it’s too hot. Cool! Thanks for the tip! I’ll definitely use it. You’re making me nostalgic for Paris where you can walk around eating a baguette on the street and no one pays any attention. I have made bread – many years ago. This recipe looks very tempting. Thanks for the step-by-step instructions and photos. Happy New Year to you, too, Judy. I think bread-making is one of those things that gets easier when it becomes a habit. We make all our own bread. It was somewhat of a hassle at first, but now it’s as natural and routine as taking a shower. Oh YUM! Pls pass the butter and raspberry jam. I want this warm for breakfast with a soft boiled egg! Your personality as well as your expertise beam brightly throughout your writing, Tracy. I am going to try this. In Kansas I baked a great deal with my mother while growing up, but we’re more than a mile high in Colorado Springs, and I haven’t had a lot of luck with bread. This time I will “proof” the yeast and forge ahead! And try to get hold of this yeast–we’ve experimented with lots of kinds and this one always works fabulously (not all of them work as well). When does the use of a bread machine come into play? I’ve never used a bread machine. I’m a very low-tech kind of girl. Happy New Year, back, Stafano! I agree with you, about baguettes being the world’s best bread, unless I happen, at the moment, to be eating Ken’s artisanal multi-grain hearth bread. But that’s so different from baguette that it’s not really fair to compare them. They both win the best award, in my opinion. Happy New Year, Tracy! 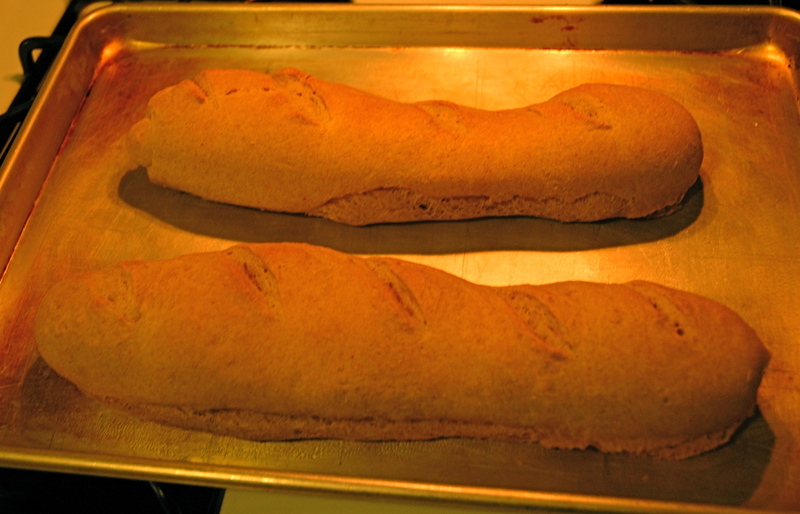 I love to make my own bread too, thanks for the great recipe. I find bread-baking so soothing. And creative! What a great, and really simple recipe. I hate (and I mean, hate, not dislike) baking, as you know, but I can see myself trying this out. What I do when I want to feel clever and thrifty gourmet? Risotto. So easy once you get the hang of it, not really expensive, and definitely gourmet food (those admiring glances when your friends eat what they think was concocted with whatever magic I have in my hands). Besides, it is, actually, better. 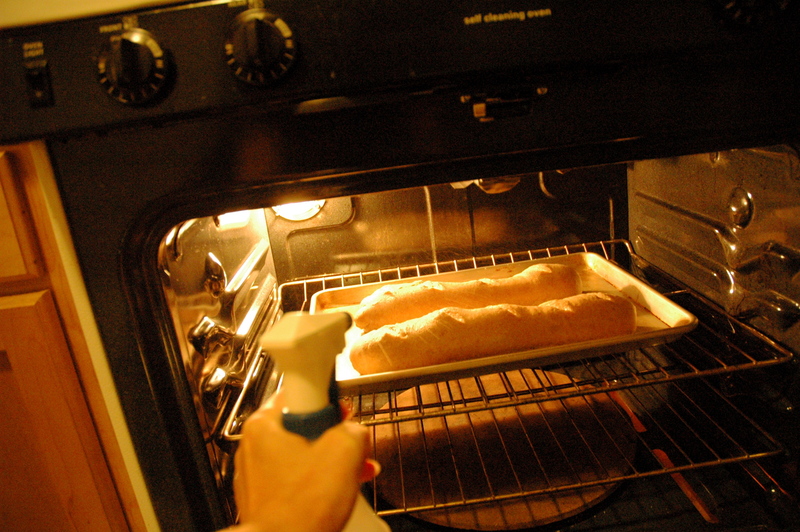 I had forgotten that little quirk of yours about baking–it must have something to do with your lawyerly-ness. But, strangely, I understand it. I didn’t much like baking when I was your age. (Age changes us–really, it does). But, I never HATED it. There’s something very interesting, intriguing, about someone who HATES baking. Don’t get me wrong, I don’t hate the results…it’s the act. I feel deprived of all creativity, having to stick pretty much to recipes and rules on what to do when for how long and what ingredients need to be in in what quantity etc. I find that stifling and inhibiting my potential. But then again, as you say, age changes us, and it definitely does….we’ll see where it takes me. I get it! There needs to be a cookbook for people like us — about how to bake with creativity/variation (listing when/where/what can be varied, and what kind of results to expect). Baking is chemistry, and Ken and I do experiment, create, very often. Most of our “recipes” are ones we created (so following them doesn’t feel like following someone else’s “rules” — it feels like we found the eureka thing that gives us the exact result we were looking for).